Macedonia has agreed to change its name to end a 27-year dispute with Greece. 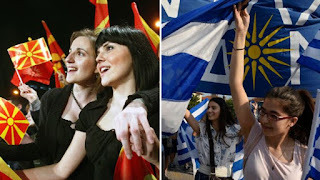 The country will now be known as the Republic of North Macedonia, or Severna Makedonija in Macedonian. Greece has argued since Macedonia's independence from Yugoslavia in 1991 that the young country's name implied a claim to the territory and ancient heritage of Greece's northern region of Macedonia - the birthplace of ancient warrior king Alexander the Great. Previous administrations in Macedonia's capital, Skopje, resisted demands to change or modify the name. The dispute strained relations between the two neighbours, and the United Nations appointed a special envoy to mediate. Greece will lift its objections to Macedonia's accession to NATO and the European Union once the dispute is resolved. Greece's Prime Minister Alexis Tsipras said a deal had been reached that would give Macedonia a different name which would be used domestically and internationally. He said: "We have a good agreement that covers all the preconditions the Greek side had set."